From his corner office on the 20th floor of 150 West 30th Street, Asher Bernstein has a clear view of the Hudson Yards worksite three blocks away. He can also see how and where the ripple effects from that transformative development will land, but he doesn’t need a high-rise for that, he’s got nearly a century of inherited knowledge to stand on. “I’ve been in business now for 46 years and it’s given me the privilege to see trends and understand what’s happening — I’ve been through many a recession and seen the gentrification that’s taken place here,” Bernstein said. As president of Bernstein Real Estate, Asher Bernstein is the “strategy guy and the big picture guy” for the 91-year-old family company. His son, Alex Bernstein, is in charge of new business and views himself as the team’s creative problem solver while Vincent Terranova is the executive vice president and handles the finer details of the operation; they conduct most of the day-to-day business. Together, the trio runs a company that owns and manages roughly 1.5 million square feet of property spread throughout 20 buildings in Manhattan, most of which are within a half-mile radius of its headquarters at the corner of Seventh Avenue and 30th Street. Though their portfolio isn’t as robust as other Midtown West players, such as Vornado or SL Green, they feel well positioned to reap the benefits of the area’s Hudson Yards-driven resurgence because of their collection of office space and their track record as sound landlords. They’re also exploring the world of sustainability and looking for opportunities to breathe new life into the area once known as the Fur District, a part of town now dominated by sports bars and chain restaurants. 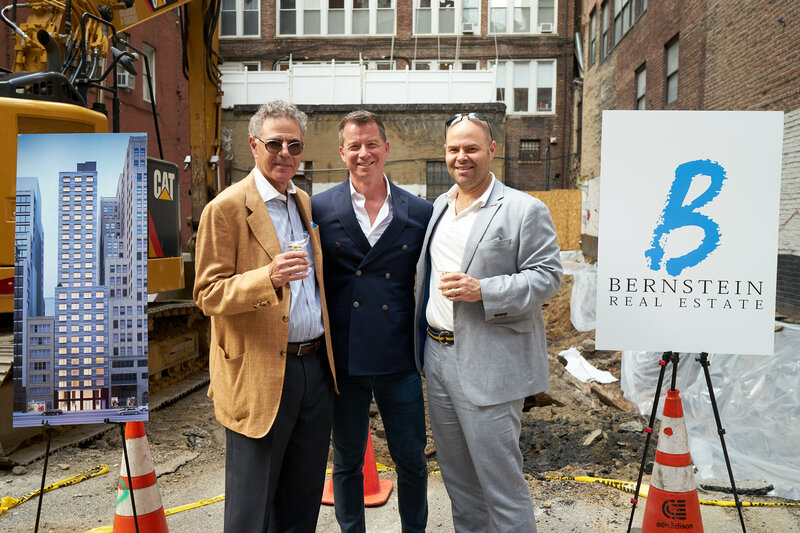 Founded in 1926, Bernstein Real Estate is one of the oldest family-owned development firms in the city, although it has mostly flown under the radar. It has avoided high-profile deals and flipping buildings for quick profits. Asher Bernstein takes pride in being a long-term landholder. Most of those bricks have been used to build Class B office buildings. While not the sexiest of properties, the elder Bernstein said space in these structures will soon be a hot commodity as other office buildings, such as the Kheel Tower on Seventh Avenue and the Cass Gilbert at 130 West 30th Street, are converted into luxury condos. While his properties have few vacancies at the moment, Asher Bernstein said he believes his firm’s holdings in the secondary office market will remain a strength for the foreseeable future, especially as companies flock to be near new West Side developments. In 2014, Bernstein sold its residential management company, Lawrence Properties, and the 6,800 units it serviced to Halstead Properties. However, Bernstein has not exited the housing market entirely. It recently broke ground on a 24-story “passive house” apartment building on West 29th Street. Using high-grade superinsulation and airtight construction, the building will contain hot and cold air with 60 percent more efficiency than a standard building while also keep inside air cleaner, Alex Bernstein said. Achieving this will increase construction costs of the 55-unit apartment building by between five and 10 percent, but Bernstein said it’s a worthwhile expense. For its commercial properties, Bernstein frequently offers in-house construction and legal services. It also tries to accommodate tenants as they expand and contract. Practices such as this, along with reasonable rent rates, helped the company maintain 97 percent occupancy through the Great Recession. When times are good, as they are now, the company focuses on infrastructure; the shimmering lobby inside 150 West 30th is one example of Bernstein’s recent renovations. Alex Bernstein said he’s also exploring ways to connect tenants to one another digitally and in real life. In 2015, Bernstein converted an old fur showroom on 30th Street into Interface, an event space, and a Till and Sprocket, boutique restaurant, bar and coffee shop. Alex Bernstein said he wants to encourage tenants from his various buildings to use these spaces and turn them into the hub of what he hopes will one day be a thriving campus rather than a string of buildings that happen to share an owner.